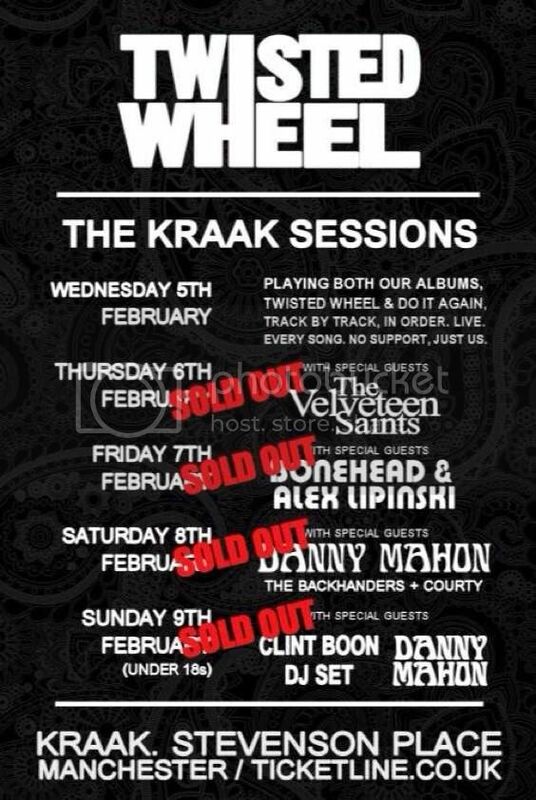 Kraak Sessions - Twisted Wheel's Kraak Gallery takeover in Manchester is taking place Wednesday 8th February - Sunday 12th February. The individual sessions will comprise a full rendition of both Twisted Wheel albums (on Wednesday), followed by various support acts throughout the week, including The Velveteen Saints, Bonehead & Alex Lipinski, The Backhanders and Courty). Meanwhile, Saturday afternoon sees frontman Jonny Brown in conversation with John Robb, and Sunday sees an under-18s, over-14s event featuring Clint Boon and Danny Mahon. Tickets on sale via Ticketline, more Details on Twisted wheel HERE.